A magnitude-6.4 earthquake struck central Iran early on the morning of Feb. 22, killing almost 400 people, injuring many more and devastating the mountainous region. The quake occurred at 5:55 am local time, centered outside of Zarand, a town of approximately 15,000 people in the Kerman province about 600 miles southeast of Tehran, Iran's capital city, according to the National Earthquake Information Center (NEIC) of the U.S. Geological Survey. Iran's central mountainous region was rattled by a 6.4-magnitude earthquake early Tuesday morning. 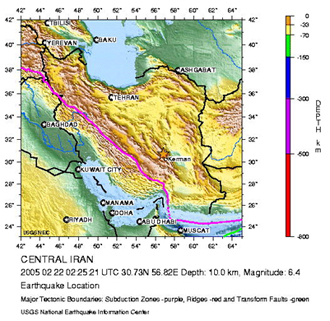 The epicenter was located 35 miles northwest of Kerman and 600 miles from the capital of Tehran. Image courtesy of NEIC. The official death toll continues to grow, but according to an Associated Press report, 420 people have been found dead and 1,000 had been reported injured. However, the latest reports from Reuters said that the earthquake will affect more than 80,000 people because of a lack of shelter in the cold, mountainous region. The larger cities and concrete buildings appear to have fared better than the mud brick homes of the rural areas, which may also have been due to the tremor's depth, reported at an estimated 26 miles, according to NEIC. Iran is one of the most earthquake-prone areas in the world, says Waverly Person of NEIC, because of the interaction between the Arabian and Eurasian plates, which move approximately 1 inch per year on average. This particular tremor is not as devastating as the December 2003 Bam earthquake, which was recorded at magnitude-6.7 and occurred only six miles belowground, but "structures are built very poorly, so it doesn't take a lot of force to bring them down, killing a lot of people," Person says. At this point, Iran has not requested international assistance, says Lou Fintor of the U.S. Department of State, but the United States "would be prepared to provide help if need be," he says.